Aerial History: Walter Hughes isn't afraid to talk about his difficult past with the B-24. Bestselling authors often pay out long lists of friends and loved ones to acknowledge for inspiration while writing works that rise to the top of the bestseller lists. But in his penultimate book, 2001's The Wild Blue--about the crews who flew bombers over Europe during World War II--the late, great historian Steven Ambrose thanked a pair of airplanes. A flight in the co-pilot's seat of two of the only remaining B-17 and B-24 bombers, he wrote in the book, provided a rare glimpse into the Herculean effort required to get these legendary aircraft into the air and to keep them there while dodging groundfire and fighter attacks. A literary champion of the citizen-soldier, Ambrose was also quick to credit the people of the Collings Foundation, a nonprofit group that maintains two of the only remaining examples of these massive planes from the golden age of aviation, for sending these mechanical museums around the country. As part of the Wings of Freedom Tour showcasing two of the most recognized aircraft of the World War II era, the Collings Foundation B-17, named Nine-O-Nine, and their B-24, named The Dragon and His Tail, visit Watsonville Municipal Airport Thursday through Sunday for the 2003 Watsonville Fly-in and Airshow. Like the dozens of other aircraft on display at the airshow, Nine-O-Nine and The Dragon and His Tail have stories that are narratives about people captivated by the romance of flying as much as they are testaments to the ingenuity of an aircraft design or American industrial might. "As one of our volunteers says, this is really a 'person-driven' organization," says Ryan Keough, who coordinates all aircraft tours for the Collings Foundation. "The aircraft are only cast members." On a clear day in May, Nine-O-Nine and The Dragon and His Tail rest on the southeast corner of the ramp at Sacramento's McClellan Airfield. The strip, located about three miles east of downtown Sacramento, has recently converted from an Air Force repair and logistics center that has resided on the property since 1938. The buildings on the airfield haven't lost their military countenance, however, and the fastidiously maintained B-17 and B-24 look at home among the tidy beige hangars. This three-day stop in Sacramento isn't connected with any airport event, so the noontime crowd visiting The Dragon and His Tail and Nine-O-Nine is minimal. Half a dozen visitors wend their way around and through the aircraft while volunteers work on the exterior of Nine-O-Nine. At the top of a 12-foot ladder, Paul Howes polishes the spinner on the propeller of the port-side inboard engine. There's always something to do with the airplanes, he explains: cleaning, fixing or loading and unloading. A wiry young man, Howes has joined the volunteer crew as an interesting way to spend a springtime before starting studies at the university in his hometown of Luton, England. Other volunteers tend to merchandise tables and supply tents--all of which are loaded up into the aircraft and flown from one stop to another regardless of the weather. Old-timers like Walter Hughes join the volunteer crew to pass along a little bit of history. 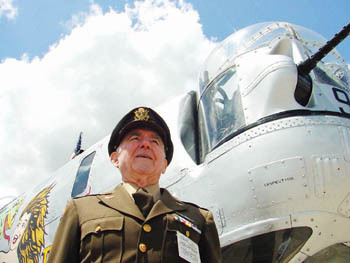 Hughes, dressed today in a vintage Army Air Corps uniform as crisp and colorful as the cumulus-dotted sky behind him, flew a B-24 like The Dragon and His Tail in the European theater during World War II. "I picked up my plane, then trained my crew, and we flew from Sacramento to England, stopping in Greenland," Hughes says of his entry into the war. After the war, he continues, even flying stateside on an airplane caused painful memories of bombing runs over Europe. "A lot of us who were in the war came home and didn't say anything about it," Hughes says. "But a few years back, I realized that no one was telling the real story." Keough says that a historical connection to the aircraft is a common reason that volunteers become involved. Some are pilots looking for experience flying an aircraft that, in its heyday, required much more aeronautical daring and cunning than the computer-assisted flying that is quickly becoming the norm among both commercial and general aviation. 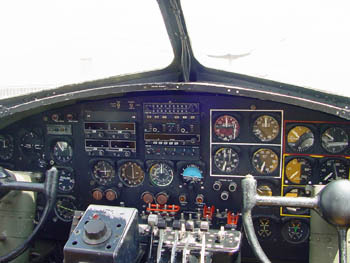 Though the control panels of The Dragon and His Tail and Nine-O-Nine have a handful of modern gyroscopic flight instruments and navigation radios, their cockpits are crowded with a staggering number of switches, levers and indicator lights for antique systems that only a specialized caste of aviators understands anymore. "The pilots who fly these airplanes are people who have taken a lot of extra initiative to come to an understanding of old aircraft, engines and systems," Keough says. "A lot of our pilots are airline pilots or former airline pilots, but we don't just take anyone who's been flying DC-9s all their career. We look for people who have flown aircraft like DC-3s" (which served as airliners during the late 1930s and as troop and cargo carriers during World War II). "Then, to begin training as second-in-command, they fly between cities on the tours--not on flights with paying passengers. Once they've got enough hours, they can track down one of the five or six people in the country still qualified to check them out for a (Federal Aviation Administration-required) type rating in the B-17 or B-24." The Collings Foundation's B-17 and B-24 join dozens of vintage aircraft on display for the 39th Annual Watsonville Fly-In and Airshow Friday through Sunday (May 23-25).Tours of Nine-O-Nine and The Dragon and His Tail are available for an $8 donation ($4 for children under 12), and afternoon flights aboard the aircraft are $400, available by prior arrangement by calling 978.562.9182. With Controls Like This, Who Needs Training? : Just jump in and fly this sucker!